Is there a Microsoft Smart Ring with gesture features on the horizon? Rumours have been emerging in the last week about a Microsoft Smart Ring in the pipeline. 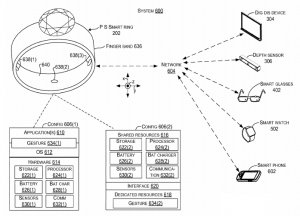 Microsoft have filed a patent for a smart ring, that includes typical functionality such as controlling other devices with the ring. However, in our opinion, the most notable inclusion in this patent is the use of gesture control. We’ll get into that in a moment, but first, let’s take a step back. Where are the heavy hitters in the smart ring game? The Smart Ring category has been around for a few years now, and there are several brands that have established a foothold. Oura, HB Ring, Orii and Kerv, appear to be the leaders at the moment. Then there are dozens of lower cost NFC based rings available from eBay or Amazon, such as the Jakcom. But where are the big players? Where is Apple? Where is Google? Where is Amazon? What about Samsung? LG? Hellooo!? If you Google any of these brands and include “Smart ring” you will get hits on rumours and patents, but there hasn’t been any big play from one of these tech giants in the Smart Ring space. Why? We believe that the reason is that they are not spreading their R&D budget into Smart Rings, when phones and Smart Watches are still a driving force. That last point is the one that has us the most excited. To our knowledge, there are no current smart rings that support gesture control. There have been a couple appear in some smaller tech conferences, but we’re not aware of one currently available. Should Microsoft bring out a high quality Smart Ring that has all standard functionality (such as smart device control, NFC payment etc) as well as gesture control, then they would surely claim the bulk of the market in one swoop. The current patent describes how the gesture control may work – which really sounds as though you could touch another smart device (like a smart TV), then start gesturing to control that device. 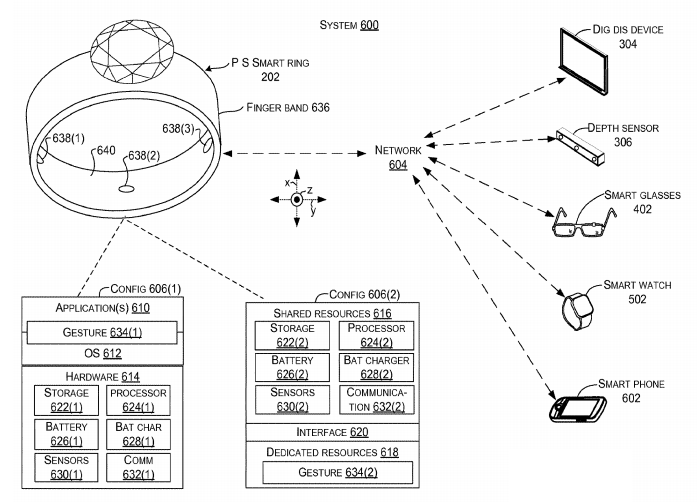 The patent describes the ability to put the ring into “gesture mode”, then move your hand in a number of ways to control another device. Tapping, swiping, scrolling and “written text” is mentioned. So what does this mean for the wearer? Well, imagine you area wearing the ring and have a smart TV. You could draw, scroll, grab, move, write….all with your hand. This could have application to for graphic designers, architects, presenters, teachers etc. What if you could tap your smart phone to create a connection, then stand back with your friends and use a gesture to trigger the camera to take a photo? What if you’re on your couch and you could use a gesture to control the tv channel and volume? The patent goes into quite significant detail about what gestures could be used, in combination with devices. There is a lot of coverage on how the ring would detect the gestures, including the use of an energy efficient audio sensor that could listen for the “audio signal generated by the friction between the finger and the surface.” Pretty cool. As we all know, patents are filed all the time, and many never see the light of day. A Microsoft Smart Ring has been rumoured before, (click here). However, consider the detail that Microsoft have gone to regarding the use of gestures (including formulas for how the device can compute pitch and roll angles during a hand gesture). In addition, consider that a big player has not yet landed in this sector. Whilst Microsoft have not really been in the wearables space for a couple of years, this could be a sign that they intend to carve their own niche and claim a large chunk of the market in the process. We’ll keep you post on anything else we hear about this exciting development. 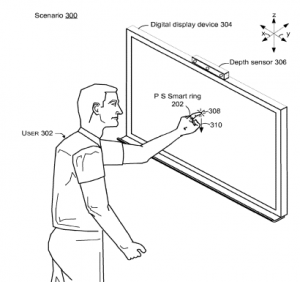 This entry was posted in Market News and tagged gesture, microsoft, smart ring. Bookmark the permalink.